Events for the veteran athletes took top billing at the weekend with two National Championships taking place. 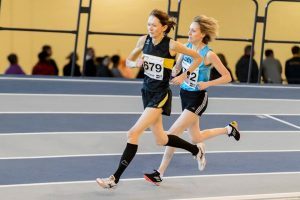 The Scottish Masters Indoors Track and Field Championships took place at the Emirates Arena,Glasgow on Sunday with the Scottish Masters Cross Country Championships at Dean Castle Country Park,Kilmarnock on the Saturday. Yvonne Crilley was the only LRC member in action at the indoor championships where she produced an excellent run to take the gold medal in the W55 800 metres. In a close finish she edged out Falkirk Victoria’s Fiona Mathieson with Yvonne clocking 2:32.22 to Fiona’s 2:32.56. Ann Howie,Aberdeen AC took the bronze medal in 2:39.89. In the overall 35-64 category the Lothian runner placed second behind F45 runner Claire Constable,Northern Vets. The club had seven representatives at the Masters Cross Country Championships in Kilmarnock. All the races were over a 6k course. In the M40 category the quartet of 6th Malcolm Lang 31.38, 9th Colin Partridge 32.17, 14th Alan Knowles 33.04 and 21st Barry McComish 34.12 finished 5th behind winners Corstorphine AAC in the team event. Ian Leggett picked up a bronze medal in M75 age group with Brian Lees finishing 26th in the M50 category. Completing the LRC representation was Kenny Mearns who came home in 37th place in the M55 category in 45.47. Two more of the club veterans were in action in the third race of the Strathearn 5k Trail Series at Methven,Perthshire. Alec Agnew finished 20th and 2nd M60 in 28.43 with Cliff Dicker 44th in 39.56.